Sorry, there are no shows on sale at Dominion Theatre right now. The Dominion was built in 1928-29, designed by W and TR Milburn with a steel-framed construction and a concave Portland stone facade. It was built as a theatre for live shows, but after faltering business in the early 1930s, the building was converted to also allow it to show films. The theatre was built on the location of the former Horse Shoe Brewery, which was the site of the 1814 London Beer Flood. During the 1980s it became a popular venue for music concerts. Tangerine Dream's album Logos was recorded there in 1982, and contains a tune called "Dominion" in tribute, and Dolly Parton's 1983 concert at the Dominion was filmed and released as a television special, Dolly in London. In the mid-1980s the Dominion hosted the musical 'Time', and the interior was extensively reconstructed to accommodate the shows effects. Since the early 1990s the venue has played host to David Ian and Paul Nicholas' new production of Grease, Scrooge: The Musical, Matthew Bourne's Swan Lake, Disney's Beauty and the Beast, a return of Grease, and Notre Dame de Paris among others. Bernadette The Musical, written by Maureen and Gwyn Hughes, also enjoyed a short run in 1990. In the 1990s the Dominion also hosted the Royal Variety Performance on a number of occasions. In 2002, the hit stage musical We Will Rock You, based on the songs of Queen, created by Queen guitarist Brian May and drummer Roger Taylor together with British comedian Ben Elton opened. It is now the longest running show at the Dominion. 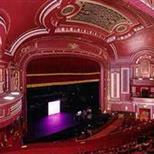 The theatre is within walking distance of Charing Cross and Euston mainline stations. You can get buses 1, 7, 8, 10, 14, 24, 25, 29, 55, 73, 98, 134, 176, 242 and 390. Adeline Place NCP carpark is on Great Russell Street, immediately adjacent to the theatre and a short walk from the front doors. The theatre foyer is fully accessible to wheelchairs. Within the auditorium, they have the Nederlander Box with three wheelchair spaces which has level access from the street and a dedicated accessible toilet. They also have a wheelchair lift providing access from the foyer to the stalls for those who prefer to transfer from a wheelchair to their theatre seat. There is an accessible toilet located on the stalls level and an attendant can return your wheelchair to you at the interval if required. Unfortunately due to weight restrictions, the lift is unable to carry electric wheelchairs. As there are only 9 steps down to the stalls level, they recommend stalls seating for any patrons with restricted mobility. Please note that there is not a lift up to the Circle level. They have an infra-red hearing system installed in the auditorium allowing for the show to be accessible for the hearing impaired. The system operates on infra-red beams transmitted to a receiver which is on either a headset or a neck loop which the patron wears. They have both the headsets and neck loops available. Guide dogs are most welcome everywhere in the theatre, and may be taken into the auditorium if required. However due to the sound levels it is recommended the dog is looked after by theatre staff. If you would like to bring a guide dog, please contact the theatre in advance on 020 7927 0900 and select the option to speak to the Front of House team. If you would like to book tickets or discuss access requirements, please call the venue on 020 7927 0929 or email access@dominiontheatre.com including your telephone number.